At Cisneros Interactive, under RedMas, we launched the first and only audio advertising network in Latin America and the United States Hispanic market, Audio.Ad. We did this because we are optimistic that users will increase their listening time on streaming services. 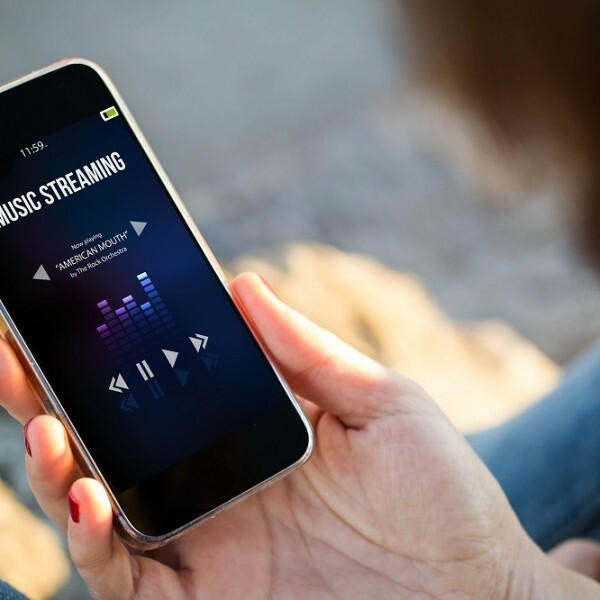 Just like video/tv is seeing a monumental shift from Linear TV to video streaming (TV Everywhere, Netflix, YouTube, etc), we know that audio/radio is going the same way, and more listeners will stream podcasts, music, and news shows on their desktops and smartphones. So why do I have such a negative title to this blog? Well, because the most popular companies offering these streaming services have monumental revenues and growth, but are still losing money. Why? Large parts of their revenue is going to music labels and publishers. Pandora, which happens to be the #1 radio station in the USA in terms of audience (streaming or terrestrial), offers a “customized radio service” which in my opinion is truly fantastic. It is a publicly traded company, so here are their financials: 2015 Revenue of $1.2B, with an operating loss of $170M. In 2014 their revenues were $920M up from $600M in 2013. In 2016 their revenues, mostly from advertising, will probably increase another 20% but the company is still racking up losses. About 50% of its revenues go to pay music rights. Spotify, is a global company with about 30 million paying subscribers and 70 million free, advertising supported users. Its “on-demand” service is also fantastic. Based on a Wall Street Journal article, “Spotify Seeks to Fine-Tune Music Rights as It Gears Up for IPO”, these are Spotify’s financials: 2015 Revenue of $2B, with a net loss of $200M. Music labels get about 58% of the revenue, and there is an additional 15% that goes to music publishers (songwriting rights). Don’t get me wrong, there is nothing wrong with music companies getting paid, which obviously allow them to pay artists and songwriters, who are the creators of all this wonderful content. 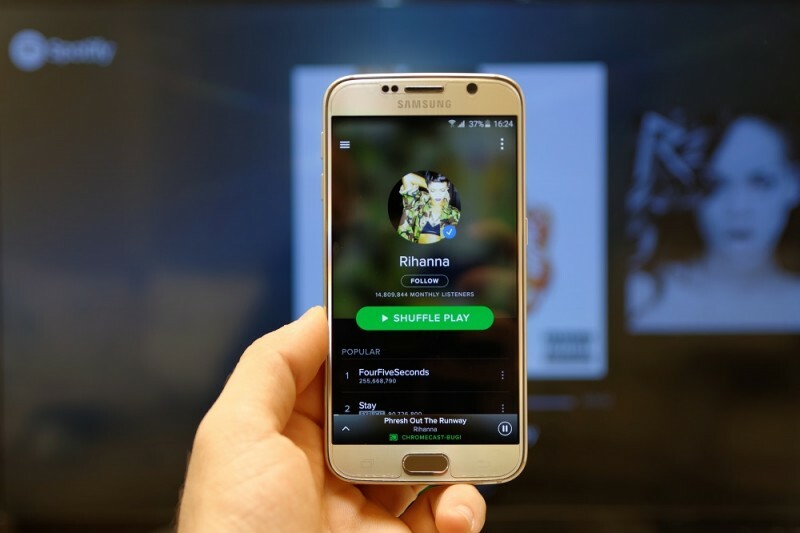 Also, both Spotify and Pandora are valued very highly (Pandora is valued at $3.2B) so investors think these companies will either renegotiate more favorable terms with the music industry or increase so much in scale that they will one day become profitable. I think the second reason is the most expected. The point of my title is that after several years in business, and with more than a billion dollars in revenues, these companies are still losing money. Margins, when positive, will probably not be big. For two companies who are revolutionizing the music industry and benefitting millions of users with a great service and the music industry as a whole with a new and large revenue stream, the value they will extract does not seem commensurate to their innovative efforts and risk they took. 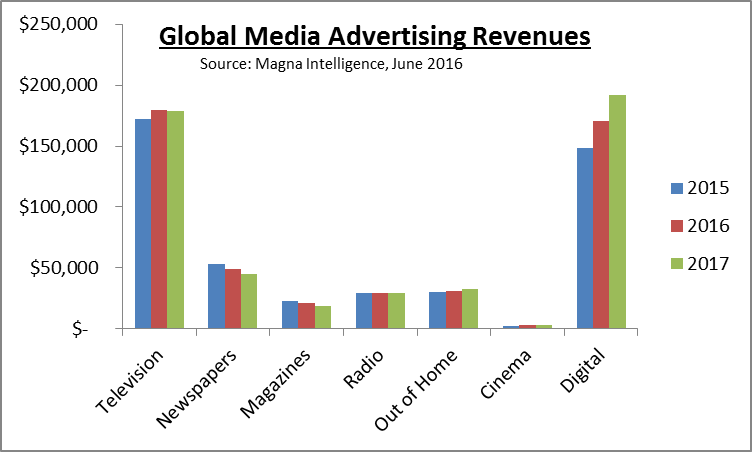 IPG’s Magna forecast reveal that TV advertising keeps on growing in 2016 and then stabilizes in 2017. 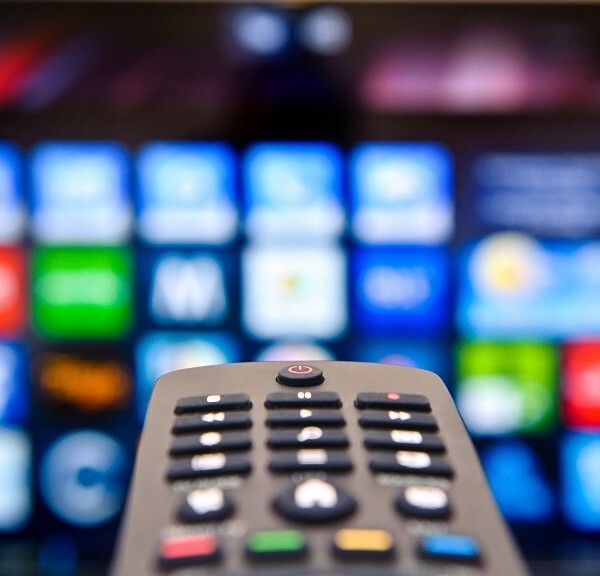 In fact, given some issues with Online Video’s scale and viewability, some advertisers have a renewed interest in TV’s ability to reach a mass audience. If you analyze the above graph and you overlay this graph with Time Spent for each media, it is understandable that PRINT (Newspapers and Magazines) has seen the most deterioration. 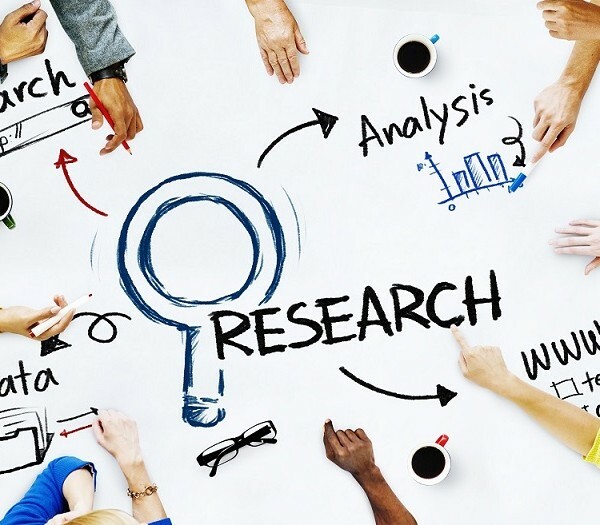 In fact, it still overindexes vs. time spent on print and digital under-indexes, which is the driver for Print’s continued advertising decline and Digital’s rise. 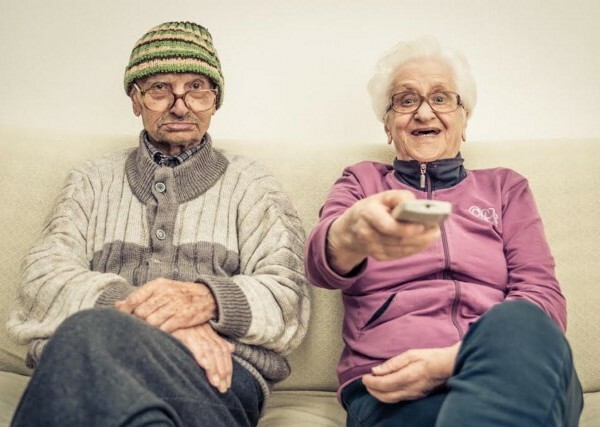 Since 2012, all age groups except 50-64 have spent less time watching TV. 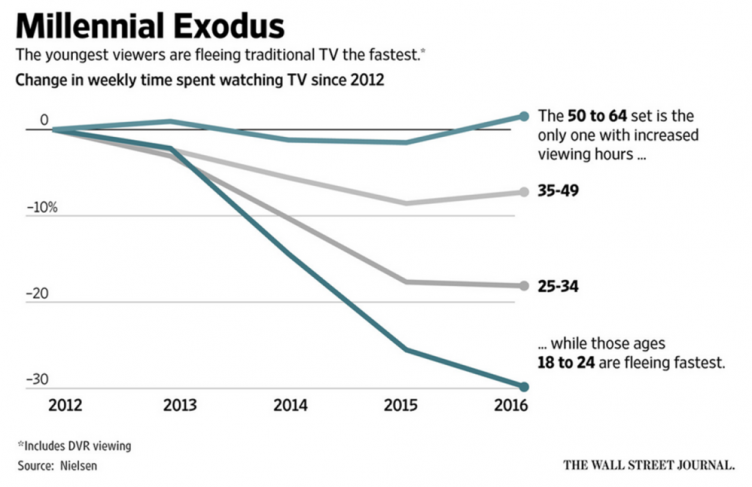 Those ages 18-24 are seeing 30% less TV since 2012! Another way of seeing this picture is that for Millennials (ages 14-23), only 49% of the time they watched movies or TV shows was on a television set. Some may say that this not a big deal because in the end Content is King, and the TV companies own this content and they can make it available on other platforms. But ask any newspaper executive and she can tell you that a reader in print is worth many times over a reader in their online edition. Cisneros has a long tradition in producing TV content and let me tell you that the monetization is very different when that content goes to a Broadcast channel than when it is seen on YouTube. Our content is viewed more than 30 million times on YouTube every month, but our annual revenue is minimal. 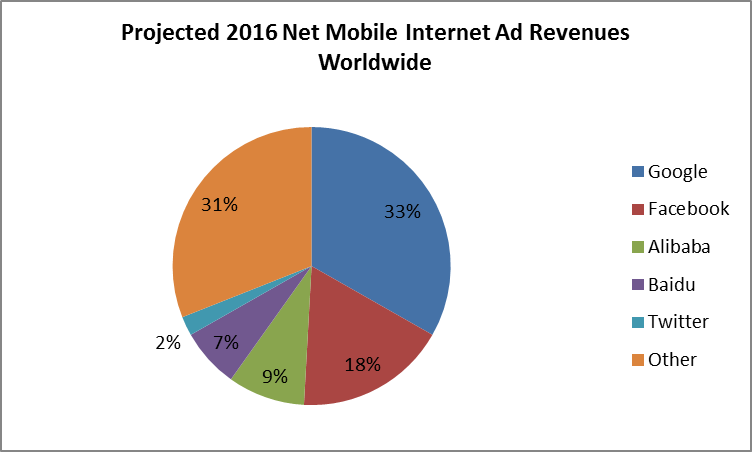 Moreover, digital advertising is extremely concentrated in two players: Google and Facebook. There is also another trend occurring which is the shift from web to mobile. In mobile advertising, the dominance of these two players is even stronger. Streaming Video: Live TV is increasingly around News and Sports – what about the other content? How will slimmer bundles hurt a programmer such as Viacom or Discovery (mostly general entertainment programming)? Audiences move to digital: with their great content, they can capture these audiences but at what monetization rates? One thing is clear: there are no boring days for media executives! I recently wrote about Millennials to clarify some myths about this demographic group. 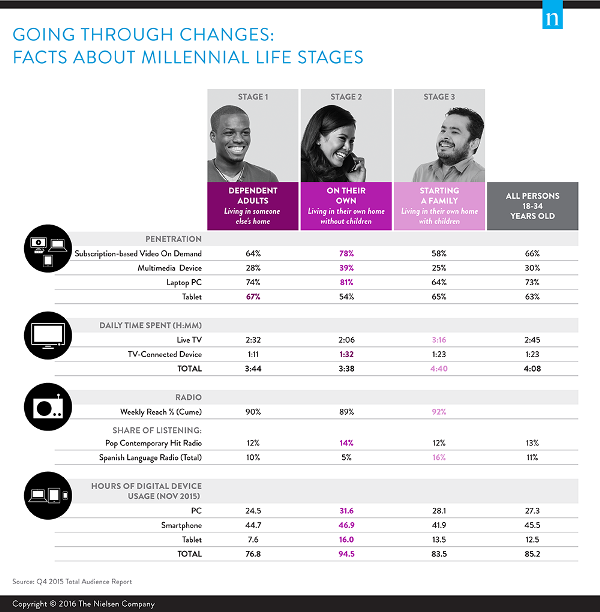 Now, upon reading Nielsen’s “Q4 2015 Total Audience Report” I realize that the term Millennials, when used to represent a monolithic group is completely wrong. I wrote that Millennials range in age from 15-35 years old and these years are transformative in the life of a person. It spans adolescence to parenthood for example. Therefore referring to all this age group as one monolithic group does not make a lot of sense from a marketing perspective. For example, there is a huge difference in the use of Netflix and other similar subscription-based video on demand services. On Their Own Millennials use this service significantly more than the other groups (78% vs. 64% for Dependent Adults and vs. 58% for those Starting a Family). 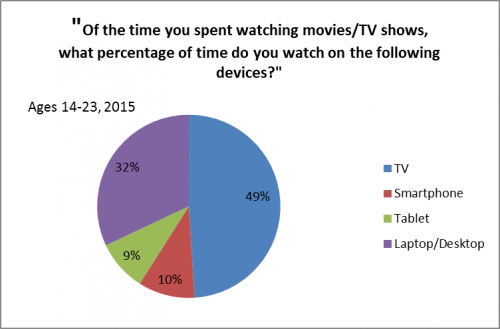 And you can see that TV and Radio consumption as well as Usage of Digital Devices also vary based on your life phase. So my whole point is why do we continue using the term Millennials? – there is ample proof that lumping a 15 year old with someone who is 34 and married is very different. As I wrote in my original article, my predictions have a high probability of being wrong. Maybe with this one I am right, which would make my prediction that my “predictions have a high probability of being wrong” wrong!